I am sure that you will join with me in congratulating these two very deserving recipients. Thanks also to those who participated in the nomination process and the IAG Awards Sub-Committee comprising Professor Steve Turton, A/Professor Ian Rutherfurd and Professor Phil McManus. The award ceremony, including the medal presentation and reading of the full citations for the awards, will be held at the IAG Conference in Canberra in July (please check the programme when available for details). Following the conference the full citations will be available from the IAG website. 2. The IAG has launched a new initiative for the promotion of geography, “Friends of Geography”, which will invite high profile individuals with geography backgrounds and interests to promote geography on our behalf. We are very happy to welcome the Honourable Laurie Ferguson MP as our first Friend of Geography. Friends will become honorary members of the Institute of Australian Geographers. They will be a select group of prominent public figures from diverse backgrounds, invited on behalf of the Institute in recognition of their long term interest in geography. They will have an understanding and appreciation for the discipline and act as advocates for geography, either based on formal training in the discipline or a strong personal passion for geography (or both). Thanks to Tom Measham for his work on this important new endeavour. Suggestions for new nominations are welcome and may be made in writing to the IAG Council. 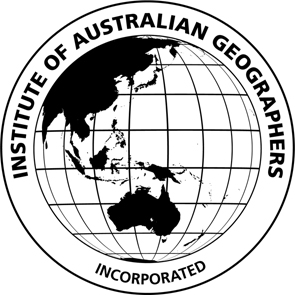 Please see https://www.iag.org.au/about/friends-of-geography/ for further details. 3. Members are reminded of the Call for Nominations for Council Positions for 2015. Please see the April Newsletter https://www.iag.org.au/2015/04/14/iag-newsletter-april-2015/  for details and the nomination form. Deadline is 18 May 2015. 4. There are New Learning and Teaching Standards for Environment and Sustainability Higher Education and I include the official information below for the information of members. 5. There will be an Annual General Meeting of the IAG on Wednesday 1 July, following the last paper session at the IAG Conference in Canberra on that day, and preceding the networking reception, please see the Conference programme when available for details. Members are advised that the Constitutional amendments proposed at the Special General Meeting on 1 May 2015 have been passed and will be shortly made available on the IAG website. Thanks to members for your support for these changes. Draft minutes of the May Special General Meeting and the previous Annual General Meeting will be circulated for the Annual General Meeting in July. Robyn Bartel, University of New England.